Diverter Valves are used to divert high temperature gas flow. Common internal combustion engine applications include diversion of exhaust gases, emissions control, and turbo charge air bypass, typical to stationary generation sets, marine engines, agricultural equipment, and on/off-highway vehicles. Diverter Valves can be utilized for nearly any application where high temperature gas must be diverted. Common miscellaneous uses include routing of exhaust gas piping in dynamometer test cells, as well as flow control in heat recovery systems. 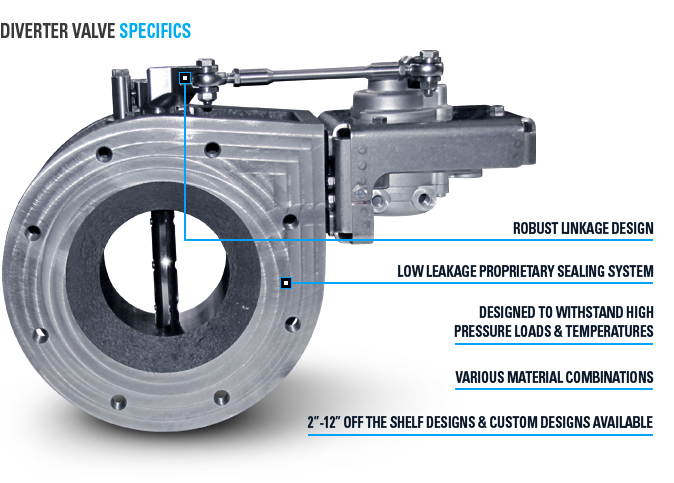 Diverter Valves are available with pneumatic, hydraulic or electrical actuators. Typically closed position flows are minimized, however custom solutions may be available upon request.